Thraikoi Hippeis were Thracian skirmisher cavalry who used hit-and-run tactics to become the bane of heavier and slower enemies. 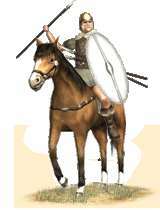 Thraikoi Hippeis are skilled Thracian skirmisher cavalry who harass their enemies with javelins. To maintain high mobility they wear no armor beneath their characteristic cloaks (called "zeira"), but their small thureos shields and Phrygian helmets with cheek guards provide some protection from their foes. They are trained in the use of the wedge formation and their Scordisci swords can be effective in close quarter fighting, but they are best used harassing infantry or slower cavalry at range. Historically, these hard-fighting troopers were known for their fearlessness and swift maneuverability. They adopted hit-and-run cavalry tactics after their many encounters with the Skythians, making the Thraikoi Hippeis the bane of heavier and slower enemies. Megas Alexandros employed Thracian skirmisher cavalry in his journeys, and their reputation was that of hard-drinking, uninhibited people. In battle they preferred to throw the first volley of cornel-wood javelins at maximum range so they could quickly ready a follow-up volley.